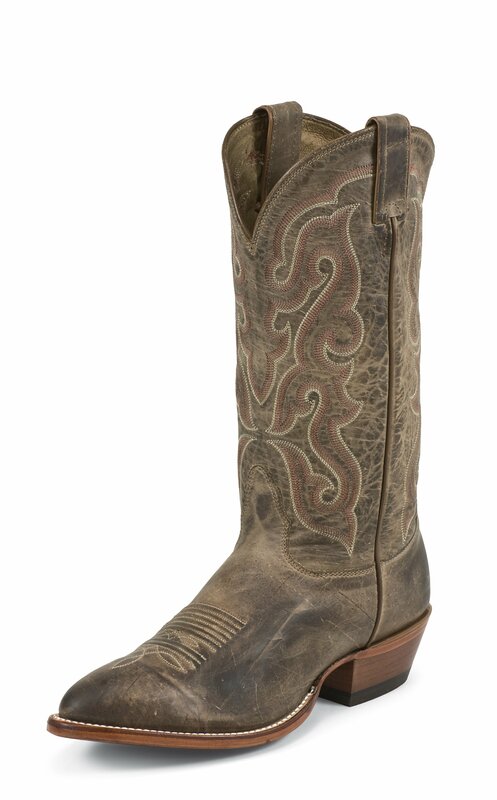 The Dallas 13-inch tall men's western boot has a vintage feel with a distressed and textured brown leather exterior. The upper has a slightly crackled surface that provides a rustic backdrop to the copper and cream stitching and pairs perfectly with the grainy weathered narrow toe foot. The single stitch welt and leather outsole add years of life to this quality boot and the cushioned insole guarantees lasting comfort in and out of the stirrup. This style is proudly Made in the USA with global parts. Living in the northern USA, our western wear stores have limited inventory and selection. With this in mind, and after reading the reviews, I ordered a pair of the Nocona vintage boots from a national western wear retailer. Upon receipt I was extremely disappointed. The boots were at least one size small. The seam in the back of the heel cut into my heel, I did not even take a step in them. The photo on the retailer web page showed a rounded toe, the boots received had an almost pointed toe.The vintage finish looked painted on. The leather was thin as a paper towel and had a shiny clear coat finish that made the boots look plastic and was rock hard. Needless to say, this experience was very disappointing. Seeing these reviews, I obviously received a pair of bad boots. Now I look forward to a minimum of a month to get me credit from this major online retailer. I definitely expected more. These are great boots for the price and USA made. They are a little lighter in color than stock photos but I'm cool with that. The fit is good if a little loose. Thicker socks and I'm fine. I usually opt for size 13 in everything I wear and they are comfy for me, so I would say they are true to size.And let me add, These are Made here in Texas. I've owned this pair for about 12 months. They were easy to break in, and I find them very comfortable. I wear these several times a week and both the sole and uppers are wearing well.This is my second pair of Nocona's, my original pair purchased 6 years ago still going strong and comfortable. Find these boots more comfortable than the newer boots made by their competitors. I also appreciate the fact Nocona still pegs its boots. The stitching has no frays, the leatherwork is topnotch. These Nocona Boots have become my new favorite boot, they are comfortable and the fit is perfect. it's hard to find great quality hand crafted boots in Canada and these are the best I've seen in a long time.